Traumatic anterior glenohumeral instability accounts for 95% of glenohumeral instability seen in clinical practice. Shoulder dislocations can also be classified either as an acute single event or as recurrent episodes (glenohumeral instability). Glenohumeral instability can be classified further by underlying causes: atraumatic (congenital laxity), macrotraumatic (resulting from an event), and microtraumatic (repetitive injury) (see the images below). Anteroposterior radiograph of the left shoulder shows posterior glenohumeral dislocation. Impaction of the humeral head on the posterior glenoid results in the reverse Hill-Sachs defect (trough sign) on the anterior aspect of the humeral head. Courtesy of Dr M. A. Png, Singapore General Hospital. Anteroposterior radiograph shows luxatio erecta, or inferior dislocation of the shoulder. The arm is abducted, elevated, and fixed. The humeral head is subcoracoid in position, with a parallel humeral shaft and a parallel scapular spine. An associated greater tuberosity fracture is present. Other subdivisions include direction and voluntary/involuntary mechanisms. A first-time acute shoulder dislocation may also represent the initial presentation of recurrent dislocation. Anterior dislocations are usually the result of direct or indirect trauma, with the arm forced into abduction and external rotation (see the image below). This is by far the most frequent type of shoulder dislocation and represents more than 90% of injuries. Of single acute dislocations, 40% become recurrent as a result of associated damage of the surrounding ligamentous and capsular structures that stabilize the joint. Anteroposterior radiograph obtained after reduction of anterior dislocation. Residual fracture fragments are noted (arrows). The most important structure stabilizing the shoulder—one that limits gross anterior-inferior subluxations and dislocation—is the inferior glenohumeral ligament (IGHL). This ligament forms a sling with discrete anterior and posterior bands. It is lax when the humerus is in the neutral position, and it allows normal shoulder movement. The ligamentous complex becomes taut in abduction and external rotation and, thus, stabilizes the joint at the end range of shoulder movement in the abduction external rotation (ABER) direction. During a dislocation, forces exceed the threshold that the ligamentous complex can bear, leading to tears or stretching. This may lead to laxity and instability. Failure of the IGHL can occur at the insertion site (40%), in the ligamentous substance (35%), and at the humeral insertion site (25%). Avulsions are seen more frequently in the anterior band and the anterior aspect of the axillary pouch, whereas ligamentous substance tears are more common in the posterior aspect of the axillary pouch. Bankart lesions represent failure of the IGHL at the glenoid insertion. IGHL capsule laxity represents intrasubstance ligamentous failure, whereas humeral avulsions of the GHL (HAGL) represent failure of the IGHL at its humeral insertion. The MGHL is often absent or underdeveloped and plays a minor role. Tears of the GHL can occur without associated labral tears and can also cause shoulder instability. A subset of these lesions initially were defined using arthroscopy (ie, anterior labroligamentous periosteal sleeve avulsion [ALPSA] lesion, Perthes lesion, glenoid labral articular disruption [GLAD], humeral avulsion of the glenohumeral ligament [HAGL]) but are also well demonstrated by magnetic resonance (MR) arthrography. A Bankart lesion is the most common lesion in anterior instability. The tear is usually large enough to involve not only the labrum, where the anterior band of the IGHL inserts, but also the middle labrum and, sometimes, the superoanterior labrum. Tears of the anteroinferior labrum are the most common subtype. The second most common subtype involves tears of the entire anterior labrum. Computed tomography (CT) arthrography and magnetic resonance imaging (MRI) can help classify the lesions for surgical planning. 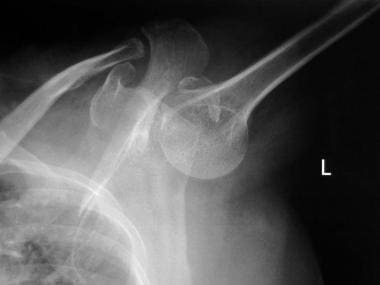 In a Bankart lesion, the scapular periosteum ruptures as the labroligamentous ligaments are avulsed from the glenoid. In Bankart variants, the scapular periosteum remains intact relative to the labroligamentous complex. If the labroligamentous complex is displaced medially and shifted inferiorly, rolling up on itself, the lesion is called an ALPSA lesion. An ALPSA lesion is associated with more severe injury. The diagnosis of this lesion in the acute setting is usually a straightforward procedure employing arthrographic findings. In chronic cases, healing and resynovialization occurs. Therefore, the ALPSA lesion may be difficult for surgeons to visualize during arthroscopy. Avulsion of the inferior glenohumeral joint from its attachment at the anatomic neck of the humerus is known as an HAGL lesion. It is often associated with tears of the subscapularis tendon and results from a shoulder dislocation. A bony humeral avulsion of the glenohumeral ligament (BHAGL) can be similar to an HAGL lesion, but it also involves the bone. This lesion occurs significantly less frequently than classic Bankart lesions. HAGL lesions are seen in approximately 9% of anterior shoulder instabilities. HAGL lesions are treated with surgical reattachment of the GHL to its humeral avulsion site. The IGHL complex may also tear at its midportion. The IGHL complex should be examined along its entire course, from its humeral origin to its labral insertion, since defects have been found at the humeral origin and within the substance of the ligament. If the labroligamentous avulsion occurs with an intact scapular periosteum and if the periosteum is stripped medially, becoming redundant, the lesion is called a Perthes lesion. A Perthes lesion is distinguished from an ALPSA lesion via the redundant periosteum versus the rolled-up, medially displaced periosteal labroligamentous mass. The avulsed labrum resumes a normal position at the glenoid margin, in which partial healing takes place. A GLAD lesion is a tear of the anteroinferior labrum (nondisplaced) with avulsion of the adjacent glenoid cartilage. A glenoid chondral defect is therefore visualized. The labrum is not detached, and there is no capsular stripping. This lesion is clinically stable. The mechanism is glenohumeral impaction in the ABER position. Clinically, these patients complain of pain rather than instability. The lesion can be treated with arthroscopic debridement without need for a stabilization procedure. A Bennett lesion is an extra-articular, posterior, capsular avulsive injury associated with a posterior labral injury and posterior undersurface rotator cuff damage. This injury is seen most commonly in baseball pitchers. The diagnosis of this lesion should raise suspicion for associated labral and rotator cuff abnormalities. The mechanism is from traction of the posterior band of the IGHL during the decelerating phase of pitching. Clinically, the throwing athlete presents with posterior shoulder pain during pitching, with posterior point tenderness. If left untreated, patients progress from functional to anatomic instability. Regarding osseous lesions, infractions or fractures of the glenoid rim (osseous Bankart lesions) are diagnostic of anterior instability when they are demonstrated on radiographs. When these lesions are detected, no other imaging is needed. However, not all anterior instabilities or recurrent dislocations are associated with an osseous Bankart lesion. The sole presence of a Hill-Sachs lesion is pathognomonic of anterior instability and is seen in 50% of patients. The need to detect the lesion is reduced if other pathognomonic findings exist (ie, anterior instability found on physical examination or Bankart lesion). The Hill-Sachs lesion describes a characteristic defect of the posterolateral surface of the humeral head and represents a compression fracture. The resultant lesion is influenced by the patient's age at dislocation and the length of time since the initial dislocation. Bankart lesions are seen less often in older patients. Older patients typically present with supraspinatus tendon (30% of tears in older patients), fracture of the greater tuberosity (one third of older patients), avulsion of the subscapularis and capsule from the lesser tuberosity (one third of older patients), and HAGL lesion. Posterior dislocations and posterior glenohumeral joint instabilities are rare (approximately 2-4%) (see the image below). They may result from a fall on an outstretched hand, direct trauma to the shoulder, or violent muscle contractions from electric shocks or seizures. As a result of acute dislocation, instability may occur, and surgical correction of the underlying damage may be indicated. Posterior instability caused by repeated microtrauma without frank dislocations may result in persistent shoulder pain in young athletes. Abduction, flexion, and internal rotation (eg, swimming, throwing, punching) are the mechanisms involved in these cases. When injuries occur in this position, the capsulolabral structures are taut, and the patterns of injury that occur most often are the reverse of those of anterior dislocation. Most patients with atraumatic posterior instability can be treated with conservative measures involving strengthening of the posterior stabilizing muscles. If this fails, surgery may be required. A fall on an outstretched hand with the arm in abduction is another mechanism of posterior dislocation. Posterior instability may also occur as an operative complication in patients with multidirectional instability after a misdirected anterior capsular procedure. 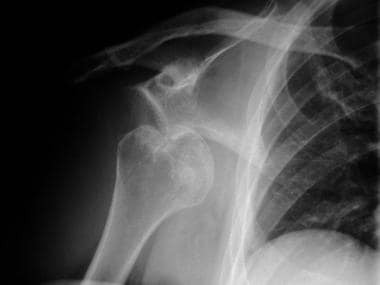 An acute posterior dislocation may remain unrecognized in 50% of patients and subsequently may present as a frozen shoulder. The posterior band of the IGHL complex is primarily responsible for capsuloligamentous restraint to a posterior translation of 90° of abduction. The anterosuperior capsule, or rotator interval capsule, also has been shown to be important in limiting the posterior and inferior translation. In contrast to traumatic shoulder dislocation, which is a frequent injury in young active patients, the onset of multidirectional instability is never the result of trauma alone. The etiology here is multifactorial, depending on labral, ligamentous, or collagenous abnormalities and impaired muscular control. The symptoms of multidirectional instability are a heavy feeling in the shoulder girdle, stiffness, mild pain, and a feeling of instability when lifting objects. Imaging is usually not necessary because multidirectional instability is mostly a diagnosis of exclusion. MRI is used principally to exclude conventional causes of instability (ie, Bankart lesion). No visible labroligamentous lesions are seen in patients with true multidirectional instability. The capsular mechanism is redundant, and the labrum is often hypoplastic. Degenerative changes of the glenohumeral joint in association with labral degeneration or tearing may be seen. Physical examination with traction applied on a patient's abducted arm causes inferior subluxation of the humeral head. This results in a visible sulcus (sulcus sign) between the prominence of the acromion and the inferiorly subluxed humeral head. Luxatio erecta (or inferior dislocation) is uncommon. This dislocation usually occurs when a direct axial force is applied to a fully abducted arm or when a hyperabduction force leads to leverage of the humeral head across the acromion, resulting in inferior dislocation of the humerus. In luxatio erecta, the inferior capsule almost always is torn. Associated bony injuries include fractures of the greater tuberosity, acromion, clavicle, coracoid process, and glenoid rim. Brachial plexus and axillary artery injuries are possible serious complications. Long-term complications include adhesive capsulitis and recurrent subluxations or dislocations. Radiographs of the shoulder are the most appropriate initial imaging study. Either MRI without IV contrast or ultrasonography (US) should be performed when rotator cuff abnormalities are suspected and initial radiographs are normal or inconclusive. Either MR arthrography or MRI shoulder without IV contrast should be performed when instability and labral tear are suspected and initial radiographs are normal or inconclusive. Either MRI without IV contrast or US should be performed when bursitis is suspected and initial radiographs are normal or inconclusive. MRI shoulder without IV contrast should be performed when adhesive capsulitis is suspected and initial radiographs are normal or inconclusive. Either MR arthrogram, MRI of the shoulder without IV contrast, or US should be performed to evaluate shoulder pain after rotator cuff repair when initial radiographs are normal or inconclusive. Radiography of the shoulder is the most appropriate initial study for traumatic shoulder pain. In the setting of Bankart or Hill-Sachs lesions detected on radiographs, MRI shoulder without IV contrast or MR arthrography are both appropriate studies for assessing labroligamentous injuries. When physical examination and history suggest a prior dislocation event, or the presence of instability and radiographs are normal, MRI shoulder without IV contrast or MR arthrography are both appropriate studies. When physical examination is consistent with a labral tear and radiographs are normal, MR arthrography, CT arthrography, and MRI shoulder without IV contrast are appropriate studies. When physical examination is consistent with a rotator cuff tear and radiographs are normal, MRI without IV contrast, MR arthrography, or US are appropriate studies. 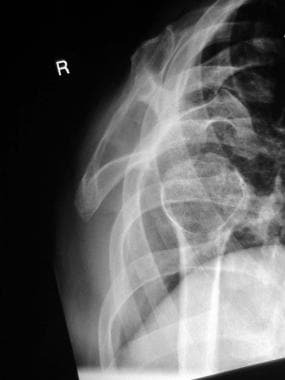 Anteroposterior radiograph of the right shoulder shows anteroinferior glenohumeral dislocation. Impaction of the inferior glenoid causes the Hill-Sachs defect on the posterosuperior humeral head. 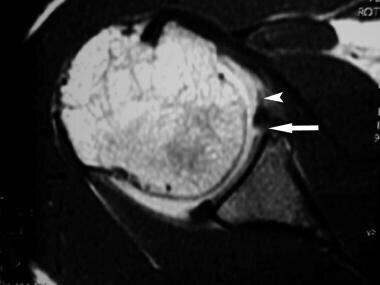 Axial, gradient-recalled echo T2*-weighted conventional magnetic resonance imaging (MRI) scan of the right shoulder shows a small, undisplaced tear (arrow) of the anterior labrum. The patient had one episode of an anterior dislocation. Coronal, spin-echo T1-weighted conventional magnetic resonance imaging (MRI) scan of the left shoulder shows a large Hill-Sachs defect (arrows) in the superolateral humeral head. The patient had one episode of an anterior dislocation. 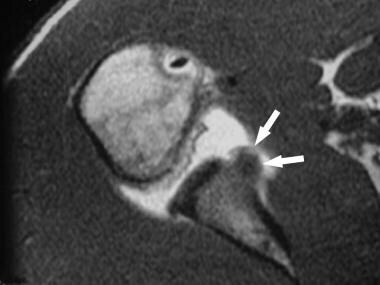 Coronal, fast spin-echo T2-weighted conventional magnetic resonance imaging (MRI) scan of the left shoulder shows a large Hill-Sachs defect (arrows) in the superolateral humeral head. Surrounding bone marrow edema is shown. Fluid is present in the subacromial/subdeltoid bursa (arrowheads), indicative of a full-thickness rotator cuff tear. The patient had one episode of an anterior dislocation. Axial, spin-echo T1-weighted magnetic resonance arthrogram of the left shoulder shows a deficient anterior labrum (arrows) and medial stripping of the anterior capsular attachment (arrowheads). The patient had recurrent anterior dislocations. 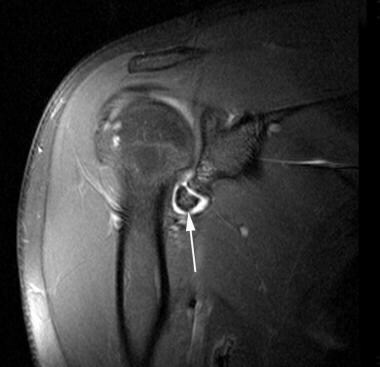 Axial, fat-suppressed, spin-echo T1-weighted magnetic resonance arthrogram of the right shoulder shows an undisplaced tear (arrow) of the anterior glenoid labrum. Part of the middle glenohumeral ligament is shown (arrowhead). The patient had one episode of anterior dislocation. Axial, spin-echo T1-weighted magnetic resonance arthrogram of the right shoulder shows an undisplaced tear (arrow) of the anterior glenoid labrum, which remains attached to the inferior glenohumeral ligament (arrowhead). The patient had recurrent anterior dislocations. Axial, spin-echo T1-weighted magnetic resonance arthrogram of the right shoulder shows an anterior labroligamentous periosteal sleeve avulsion lesion (arrows), seen as a rolled-up mass anterior to the neck of the scapula. The patient had recurrent anterior dislocations. Axial, spin-echo T1-weighted magnetic resonance arthrogram of the left shoulder shows a Perthes lesion (arrows). The anterior labrum is avulsed together with the intact periosteum of the scapula. The adjacent middle glenohumeral ligament (arrowheads) is shown. The patient had one episode of an anterior dislocation. 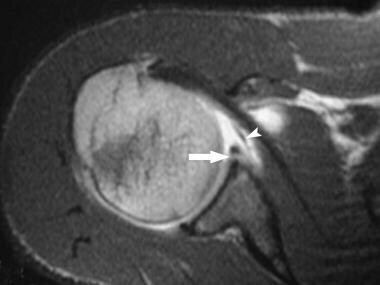 Axial, fat-suppressed, T1 shoulder magnetic resonance arthrogram reveals a chondral defect (arrow) in the anterior glenoid, which is filled with contrast material. The hyaline cartilage shows decreased signal intensity (arrowhead). The anterior labrum is in its normal location. Courtesy of Dr W. R. Reinus, Mallinckrodt Institute of Radiology, St Louis, Mo. 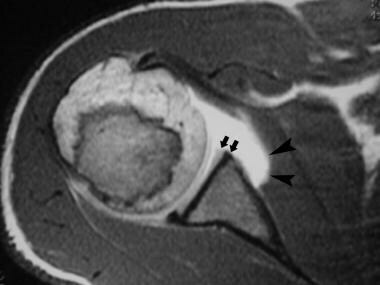 Coronal, fat-suppressed, spin-echo T1-weighted magnetic resonance arthrogram image of the right shoulder shows a loose body (arrow) in the axillary recess. The patient had a previous dislocation. Axial, spin-echo T1-weighted magnetic resonance arthrogram of the right shoulder shows tear of the posterior glenoid labrum (arrow) and a reverse Hill-Sachs defect (arrowhead). Patient had previous posterior dislocation. 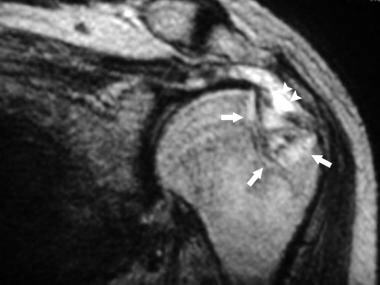 According to Ng et al, MRI is a useful and objective method to assess capsular laxity in patients with recurrent shoulder dislocation. The sensitivity and specificity to detect capsular laxity were 92% and 100%, respectively, for clinical tests and 85% and 96% for MRI. The authors investigated the usefulness of MRI in assessing capsular laxity in 64 patients with recurrent shoulder dislocation who underwent MR arthrography. The patients were divided into 3 groups: no shoulder dislocation; first dislocation; and recurrent dislocation. Magee et al reported that MR arthrography showed statistically significant increased sensitivity for detection of partial-thickness articular surface supraspinatus tears, anterior labral tears, and SLAP tears compared with conventional MRI at 3-T. The study included 150 consecutive conventional shoulder MRI and MR arthrography examinations on patients 50 years of age or younger who subsequently underwent arthroscopy. All patients selected for arthroscopy had abnormal findings on clinical examination and MRI or MR arthrography. Three full-thickness and 9 partial-thickness supraspinatus tendon tears, 7 superior labral anterior-to-posterior (SLAP) tears, 6 anterior labral tears, and 2 posterior labral tears were seen on MR arthrography but not on conventional MRI. Double-contrast axial computed tomography (CT) arthrogram of the left shoulder shows an undisplaced tear (arrows) of the anterior glenoid labrum. The patient had one episode of an anterior dislocation. Double-contrast axial computed tomography (CT) arthrogram of the right shoulder shows a deficient anterior glenoid labrum (arrows) and medial stripping of the anterior capsular attachment (arrowhead). The patient had a recurrent anterior dislocation. US can evaluate musculoskeletal soft tissues in real time. Consequently, US plays an increasingly important role in shoulder imaging, demonstrating accuracies in the detection of rotator cuff and adjacent soft-tissue abnormalities. However, US has limited usefulness in patients with traumatic shoulder pain that cannot be localized to the rotator cuff or biceps tendon. US is comparable to MRI in evaluating full-thickness rotator cuff tears and rotator cuff atrophy, but inferior to MRI in evaluating partial-thickness rotator cuff tears and other intra-articular pathology. US is well tolerated and, as with MRI, involves no ionizing radiation. Radiography cannot demonstrate labral, ligamentous, or capsular lesions. MRI is more sensitive and specific and has superseded CT arthroscopy for demonstrating intra-articular and periarticular soft-tissue structures. Although conventional MRI and MR arthrography are the modalities of choice, their use is limited by their cost and limited availability. In regions with fewer resources, CT arthrography is a good alternative. Limitations of arthrography include discomfort to patients, risk of septic arthritis, and the need for contrast administration. Use of gadopentetate dimeglumine in intra-articular injections has not been approved by the Food and Drug Administration (FDA). The radiologist needs to be aware of the potential pitfalls (ie, the false-positive and false-negative findings) that can occur with each imaging technique. Familiarity with the limitations of each technique and with normal anatomic variants is therefore important. In this evolving area of imaging, the radiologist should keep up to date on the best modality to use. For example, MRI is more sensitive and specific in the demonstration of intra-articular and periarticular soft-tissue structures and has superseded CT arthrography as the modality used for such imaging. Conventional MRI and MR arthrography are currently the modalities of choice. Potential problems associated with arthrography include patient discomfort, risk of septic arthritis, and the need for contrast administration. Use of gadopentetate dimeglumine for intra-articular injections has not been approved by the FDA. Institutional board approval is required for its use, and obtaining written informed consent from the patient is mandatory. Radiographs help not only in making the diagnosis but also in determining whether the changes might improve with treatment. The anteroposterior, internally rotated view is useful for demonstrating the presence and size of a Hill-Sachs defect. Special projections, including the modified Didiee, Hermodsson, Stryker, and West Point views, have been developed to increase the sensitivity of radiography in detecting the lesions. The West Point axillary view is useful for identifying the extent and presence of a Hill-Sachs lesion when it is not seen on anteroposterior, internally rotated, and Y-scapular or axillary views. Loss of the humeral head and glenoid rim bony parallelism (crescent sign) may be observed. Posterior dislocation also produces findings of glenoid rim fractures, bony fracture, sclerosis, or ectopic bone formation. 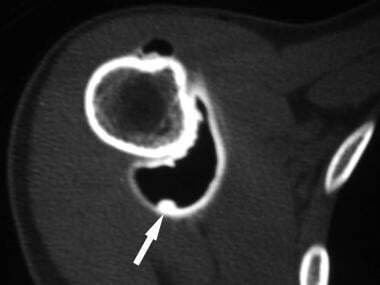 A compression of the anteromedial humeral head may be seen as a reverse Hill-Sachs lesion (trough sign). 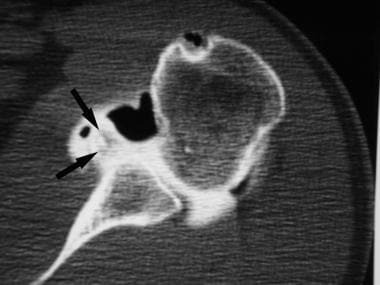 A trough sign resulting from impaction fracture of the humeral articular surface onto the osseous glenoid has been described (see the image below). Avulsion fracture of the lesser tuberosity may be visualized. Interruption or peaking of the Maloney arc, a line drawn along the lateral border of the scapula and down the medial aspect of the humerus, has been described. The humeral head is dislocated inferiorly to a subcoracoid position. The superior aspect of the humeral head does not contact the inferior aspect of the glenoid rim, and the arm is held over the patient's head in a fixed abducted position. 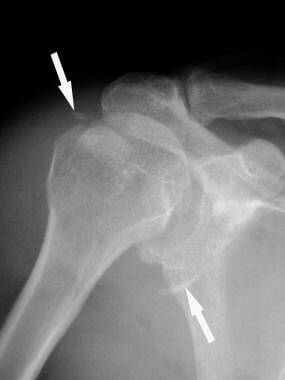 An associated fracture of the greater tuberosity may be present (see the image below). To the authors' knowledge, no group reports a single rate (even as an estimate) of anterior instability; however, a Hill-Sachs lesion is seen in approximately 50% of radiographs in patients with anterior instability, and other osseous lesions are seen in 10-15% of radiographs. The patient is most commonly in the supine position during CT scanning, with the arm in neutral rotation. However, imaging in the prone oblique position has been reported to be superior to imaging in the standard supine position. This position allows both the anterior and the posterior capsulolabral complex to be outlined by air. The cartilaginous labrum can be seen to be partially detached from the bony glenoid. The labrum may be shredded and torn, degenerated, or even absent (see the image below). Torn or degenerated labrum may be seen as an area of imbibition of contrast medium. Thickening of the labrum is an abnormal finding on CT arthrography. Capsular injury may be detected (see the image below). CT findings include irregularity of the scapular insertion site, indicating swelling and hemorrhage in the acute stage. In addition, acute capsular tears are evident because of extravasation of contrast medium or capsular redundancy. Ectopic calcification and ossification resulting from rupture of the scapular periosteum often are seen in the chronic stage. Injury to the capsule may be subtle, although in some patients, detachment is pronounced and stripped medially to the scapular neck. The subscapularis bursa extends medially beneath the coracoid process, and the opacified bursa normally forms a sharp transition with the scapular attachment of the capsule at or above the glenoid notch. Stripping of the capsule in anterior instability results in loss of the boundary, and a large recess is formed over the scapular neck, which is well demonstrated using conventional double-contrast arthrography. As previously mentioned, this finding is not well correlated with anterior instability. Loose bodies are visualized as filling defects in the joint space that are outlined completely by contrast material (see the image below). Double-contrast axial computed tomography (CT) arthrogram of the right shoulder shows a small, loose body (arrow) in the axillary recess. The patient had recurrent anterior dislocations. Subscapularis muscle abnormalities are seen as tears and areas of irregularity. Bony lesions, such as Hill-Sachs defects and fracture of the anterior glenoid rim (bony Bankart lesion), are readily visualized (see the images below). Double-contrast, reconstructed, 2-dimensional coronal computed tomography (CT) arthrogram of the right shoulder shows a large Hill-Sachs defect (arrow) in the humeral head. A full-thickness rotator cuff tear is present, evidenced by a large amount of air in the subacromial/subdeltoid bursa. The remnant end of the supraspinatus tendon is seen (arrowhead). Double-contrast axial computed tomography (CT) arthrogram of the left shoulder shows a bony Bankart glenoid fracture (arrows). The patient had one episode of an anterior dislocation. A Bennett lesion may be seen and appears as a crescent of mineralization on the axillary radiographic view. It is better seen on CT scans. CT findings in posterior instability include a Bankart-like lesion, tearing or shredding of the labrum, and capsular tear. However, tearing or shredding of the labrum may be the only finding. Findings are typically the reverse of the findings seen in anterior instability. Multidirectional instability resulting from previous injury usually is more prominent in one direction. In repeat microinjury (eg, due to swimming or a congenital condition), the labrum is usually attenuated and degenerated. The joint capsule may be redundant. Capsular laxity associated with multidirectional instability is diagnosed by capsular abnormalities in at least 2 directions, usually the anterior and posterior aspects. Scans obtained with the patient's arm externally rotated may demonstrate posterior lesions more clearly than other scans. Bankart lesions usually are not seen. Conventional CT can better define all of the bony abnormalities that may be missed or seen less clearly on radiographs. In addition, CT arthrography can demonstrate labral and capsular lesions. CT arthrography has a sensitivity of approximately 73% for detecting lesions of the capsuloligamentous complex, glenoid labrum, intracapsular portion of the long head of the biceps tendon, and rotator cuff. Most errors in image interpretation arise because of faulty injection technique. The capsule may be distorted by extracapsular injection or injection into the substance of the capsule. Forceful injection of contrast material into the labrum can result in localized accumulation of contrast medium, and this can simulate a tear. The primary finding of a Bankart lesion on axial MRIs is a zone or band of abnormal signal intensity, which is increased on proton density–weighted images, T2-weighted images (T2WIs), and T2*-weighted images (T2*WIs). 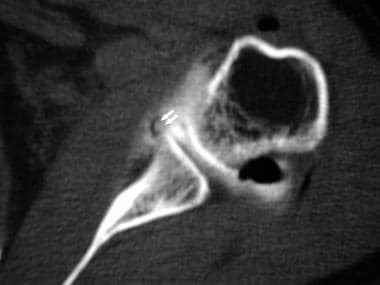 This zone separates the anteroinferior capsulolabral complex from the osseous glenoid margin (see the image below). If the dislocation is recent, an effusion is often present, and detachment of the labroligamentous complex may be visualized. Axial T1-weighted images (T1WIs) or T2WIs may show subchondral bone changes, which demonstrate low signal intensity on T1WIs and high signal intensity on T2WIs. Small separations, called partial Bankart lesions, may appear to involve the glenoid labrum alone on axial images. These are more likely to be associated with subluxational instabilities. In chronic recurrent instability, the labrum degenerates and is likely to be markedly diminished in size or to be totally absent. In long-standing lesions, in which the labrum is reapproximated in its normal position and granulation tissue forms, a zone of intermediate intensity is observed separating the capsulolabral complex from the glenoid on proton density–weighted images and T2*WIs. When seen on MRI, this pattern is a highly accurate indicator of a healed Bankart lesion. Linear tears of the labrum substance or deformity of the labrum may be observed to be damaged by the impact of the humeral head. Increased signal intensity of the anteroinferior labrum substance after acute injury or in the recurrent stage represents edema, granulation tissue, or labrum degeneration. Despite the poor definition of the labrum in the absence of an effusion, signal alterations in the signal intensity of the capsulolabral complex at the glenoid junction are demonstrated well on proton density–weighted images and gradient-echo images. Type 1 - Increased signal with no surface extension, representing internal degeneration without tear. Type 2 - Blunted or frayed labrum with normal dark intensity. Type 3 - T1 or T2 signal extends to the surface. Type 4 - This is a combination of abnormal morphology with type 2 features and increased signal intensity extending to the surface with type 3 features. A useful finding for separating an acute Bankart lesion from a chronic one is increased signal intensity in the subchondral bone on fat-suppressed, fast spin-echo T2WIs or short-tau inversion recovery (STIR) images. Capsular lesions are well depicted, but only if an effusion is present. The capsule is often wavy or stripped from the periosteum, and it is an accurate indicator of a stretched or redundant capsule. In the subacute stage, irregularity of the joint capsule with intermediate signal intensity is observed. After the acute soft-tissue changes resolve, the capsule and capsular ligaments fold over, producing an area of low signal intensity. A region of signal void is also seen in ectopic bone formation. Osseous lesions are seen as areas of decreased signal intensity on T1WIs, and they may be relatively bright on T2WIs (see the images below). Hill-Sachs lesions are evaluated best at the level of the coracoid process and range in appearance from mild flattening to wedge-shaped defects of the humeral contour. Conventional MRI is superior to CT arthrography for evaluating these lesions. ALPSA, Perthes, and HAGL lesions cannot be detected reliably on conventional MRI, and arthrography is recommended. Gadolinium-based contrast agents have been linked to the development of nephrogenic systemic fibrosis (NSF) or nephrogenic fibrosing dermopathy (NFD). The disease has occurred in patients with moderate to end-stage renal disease after being given a gadolinium-based contrast agent to enhance MRI or magnetic resonance angiography scans. NSF/NFD is a debilitating and, sometimes, fatal disease. Characteristics include red or dark patches on the skin; burning, itching, swelling, hardening, and tightening of the skin; yellow spots on the whites of the eyes; joint stiffness with trouble moving or straightening the arms, hands, legs, or feet; pain deep in the hip bones or ribs; and muscle weakness. Using conventional MRI, findings related to posterior instability are typically the reverse of those for anterior instability. The labrum is usually detached, frayed, or torn. On conventional MRIs, the changes associated with anterior stability can also be used to identify the labral abnormalities of posterior instability. The disruption of the posterior capsule is seen as a disruption or marked irregularity of the normal, continuous, hypointense line extending from the glenoid rim to the neck of the humerus. Soft-tissue injury is visualized as an area of increased signal intensity in the soft tissues in the posterior area on T2WIs; this finding represents edema, hematoma, or extravasation of joint fluid. Discontinuity of the hypointense teres minor tendon and reverse Hill-Sachs lesion are easily demonstrated. The GHLs are best visualized when a joint effusion is present. The presence of fluid outlines the avulsed labral fragment clearly. Arthrography can be achieved by using a sodium chloride solution, direct dilute gadopentetate dimeglumine administration, or indirect gadopentetate dimeglumine administration. Patients with acute injury usually do not require arthrography, because the effusion that is present is often adequate. Patients who benefit most are young athletic individuals with the chronic, milder forms of instability. Therefore, MR arthrography is used more often in these patients and in patients in whom nonenhanced studies fail to address the clinical situation. With MR arthrography, imaging patients in the ABER position to detect anterior labral tears provides a sensitivity of 89% and a specificity of 95%, compared with 48% and 91%, respectively, in the normal neutral position. In the ABER position, the patient's arm is elevated, and the palm is placed under his or her neck. With direct arthrography, dilute gadopentetate dimeglumine (concentration of 2 mmol/L mixed in normal sodium chloride solution) is injected into the shoulder, usually via an anterior approach. Approximately 12-20 mL of dilute gadopentetate dimeglumine is used. The shoulder may be exercised gently and passively before imaging. Reasonable distention of the contrast material is usually achieved for as long as 1 hour, but this duration can be extended if 0.3-1.0 mL of 1:1000 of adrenaline also is administered into the joint. The capsular anatomy, GHLs, and the anterior and posterior labrum are best visualized in the axial plane. The superior and inferior labrum and the axillary pouch are better visualized in the coronal plane. The sagittal plane demonstrates the entire capsule, including the orientation of the GHLs, to best advantage. Labral tears are visualized as contour deficiencies of the labrum, filling of a torn labrum with contrast material, and opacification of the space between the detached labrum and the glenoid surface (see the image below). 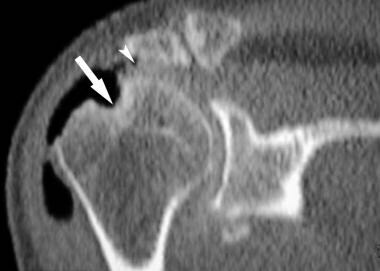 On MR arthrograms, the Bankart lesion is seen as a fragment of labrum attached to the anterior band of the IGHL and to the ruptured scapular periosteum floating in the anteroinferior aspect of the glenohumeral joint (see the image below). Axial images are more useful in demonstrating the morphology of the labrum and associated tear pattern, if present. Coronal oblique images show avulsion of the anteroinferior labrum and its relationship to the axillary pouch, which is lax when the arm is adducted. Sagittal oblique images define the size of the anteroinferior glenoid fracture and the extent of the labral tear both anterosuperiorly and superoinferiorly. 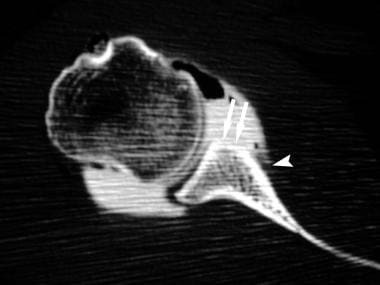 The relationship of the anterior band of the IGHL to the avulsed labrum is identified at the level of the glenoid fossa on axial and oblique sagittal MRIs (see the image below). Identifying an ALPSA lesion is desirable because the surgical treatment is different from that for a Bankart lesion. On axial MR arthrograms, the anterior labrum with stripped periosteum is seen to be displaced medially and rotated inferiorly on the neck of the glenoid (see the image below). A small cleft or separation can be seen between the glenoid margin and the labrum. In chronic lesions, the labrum is abnormally thickened and flattened because of healing, with synovial tissue between the labrum and the glenoid margin. If labroligamentous avulsion occurs with an intact scapular periosteum and if the periosteum is stripped medially, becoming redundant, the lesion is called a Perthes lesion (see the image below). A Perthes lesion is distinguished from an ALPSA lesion by the redundant periosteum versus the rolled-up, medially displaced periosteal labral mass. A Perthes lesion can be difficult to see during arthroscopy if the labrum reapproximates its normal position and is resynovialized; its appearance may be normal on conventional MRIs. Imaging in the ABER position by stretching the inferior glenoid ligament and its labral attachment can aid visualization of the abnormality. In ABER positioning, labroligamentous detachment is evident by visualizing the contrast medium separating the labrum from the glenoid rim. The HAGL lesion refers to avulsion of the IGHL from the humerus, without accompanying tear of the subscapularis. This lesion has not been shown to demonstrate an age predilection. The HAGL lesion may exist in patients with anterior instability with or without an anterior labral tear and still cause instability. The lesion is treated with surgical reattachment of the IGHL to its humeral insertion. An effusion or arthrography is usually required to visualize the lesion. On oblique sagittal images, the retracted or redundant IGHL appears as a mass of low signal intensity. As the IGHL drops inferiorly, the axillary pouch is converted from a fluid-distended, U-shaped pouch to a J-shaped structure. 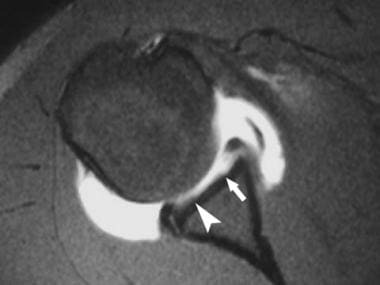 On MR arthrograms of a GLAD lesion, a superficial tear of the anteroinferior labrum is seen. The anterior glenoid has a chondral defect, which is filled with gadolinium. The labrum remains attached to the anterior scapular periosteum, distinguishing this from a Bankart lesion, which has torn periosteum (see the image below). Isolated GHL tears are best visualized by using MR arthrography. Signs include thickening, a wavy and irregular contour of the GHL, and increased signal intensity. The IGHL is considered abnormal if it is absent, discontinuous, attenuated, or attached to the scapular neck medial to the glenoid rim. MR arthrography has been shown to be effective in detecting loose bodies in the shoulder (see the image below). Loose bodies usually are hypointense on T1WIs and on T2WIs and lie in a dependent position. A Bennett lesion appears as a low signal intensity band posterior to the posterior labrum on the axial images (crescentic mineralization). Due to calcification, there is thickening and low signal of the posterior capsule/posterior limb of the inferior GHL. The adjacent labrum is normal. For osseous lesions, axial T1WIs show subchondral bone changes, including low–signal-intensity sclerosis or marrow edema at the fracture site. Hill-Sachs lesions produce changes similar to those seen on conventional MRIs. Crescentic extra-articular ossification may be demonstrated on CT scans or MRIs. 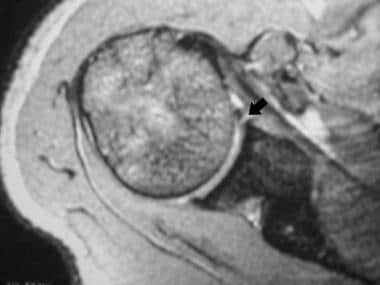 Associated reactive, anteroinferior glenoid rim sclerosis may exist. MRI findings include low–signal-intensity calcification. Ossification may not be identified arthroscopically because of its extra-articular location. Findings are typically the reverse of the findings seen in anterior instability. Appearances on MR arthrography include all those found on conventional MRI findings, as well as extravasation of contrast material into the soft tissue behind the shoulder joint. Tearing or shredding of the posterior glenoid labrum may be seen. Capsular detachment or stripping is less common. Capsular tear and disruption of the posterior cuff may occur with more severe injuries and may result in formation of a subcapsular synovial recess. Glenoid margin erosions, sclerosis, or ectopic bone formation may be seen. 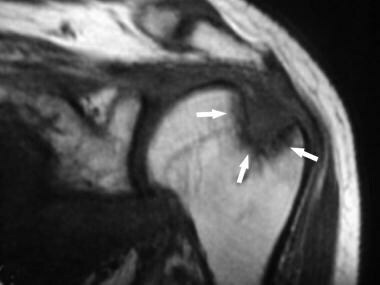 Axial MRIs usually demonstrate the posterior labrum disruption well (see the image below). The abnormal laxity or redundancy of the torn posterior capsule also may be seen on axial images. The humeral head is often also subluxed posteriorly relative to the glenoid fossa. MR arthrography demonstrates posterior contrast extension into the planes between the posterior labrum, the capsule, and the infraspinatus muscle. Conventional MRI has been reported to have sensitivities of 67-86% and specificities of 44-95% in the diagnosis of glenoid labral tears. MR arthrography has been reported to have sensitivities of 90-95% and specificities of 67-86%. MR arthrography is more accurate than CT arthrography for evaluation of the capsuloligamentous complex, glenoid labrum, intracapsular portion of the long head of the biceps tendon, rotator cuff, and osseous lesions. Common variants may simulate labral lesions, including the sublabral foramen, Buford complex, and hyaline cartilage undercutting of the labrum. A sublabral foramen located between the labrum and glenoid rim is a frequent cause of misinterpretations of anterior labral disruptions or tears. This has been reported to occur in as many as 11% of individuals. In contrast to a Bankart lesion, the sublabral foramen is seen superior to the anterior glenoid notch or above the physeal line representing the superior one third of the glenoid. Bankart lesions usually involve the labral tear or avulsion at or below the level of the subscapularis tendon. This is located below the physeal line or equator (the physeal line divides the bony glenoid into an upper one third or lower two thirds corresponding to the 2 glenoid ossification centers). The incidence of Buford complex is approximately 1.5%. The cordlike MGHL attaches directly to the superior labrum. Distinguishing a Bankart lesion from a Buford complex is easy because in the former, the anteroinferior labrum is torn or avulsed and does not appear firmly attached to the anteroinferior glenoid rim. In hyaline cartilage undercutting of the labrum, articular cartilage is present between the labrum and the glenoid bony cortex, predominantly in the superior half of the joint. This interface can simulate a labral tear on axial images. In general, superior labral tears are oriented laterally, while the cartilage interface is oriented parallel to the glenoid cortex. Variation in size and morphology of the labrum remains a source of error. A small labrum may not be distinguishable from a mildly degenerated and deficient labrum. Some anatomic variations that are differentiated easily with MR arthrography present diagnostic pitfalls with conventional MRI. Normal, intermediate–signal-intensity labral fibrocartilage at the base of the anterior labrum rarely presents a problem, because the cartilage has signal intensity lower than that of the contrast medium. Normal GHLs often can simulate torn labral fragments on conventional MRIs. With MR arthrography, intact GHLs can be visualized to be separate from the labral origins of the distended capsule, and these are not confused with torn fragments. The sublabral sulci that normally fill with contrast medium remain a diagnostic pitfall and cannot be differentiated from labral tears unless the labrum is separated from the glenoid rim. Sublabral sulci involve the interface of the labrum with the articular cartilage and are located at the labral-bicipital junction or between the origins of the MGHLs and IGHLs. Complete labral detachment (sublabral hole) may also represent a normal variant. Glenohumeral joint alterations, including ALPSA, Perthes, and HAGL lesions, cannot be diagnosed reliably by using conventional MRI. MR arthrography is better than MRI in the detection of capsular redundancy. 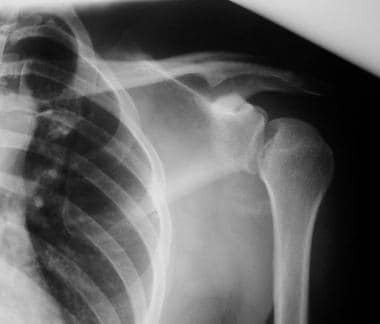 Most shoulder dislocations are reduced in the emergency department with radiographs performed to both identify the dislocation and confirm the reduction. With increasing availability of ultrasound, multiple case reports have suggested that US may be a valuable adjunct for identifying dislocations and confirming reductions. Using US for the assessment of shoulder dislocations and reductions may save time, radiation exposure, healthcare costs, and the potential need for re-sedation in select patients (due to more rapid identification of unsuccessful reductions). Monica J, Vredenburgh Z, Korsh J, Gatt C. Acute Shoulder Injuries in Adults. Am Fam Physician. 2016 Jul 15. 94 (2):119-27. [Medline]. [Full Text]. [Guideline] Expert Panel on Musculoskeletal Imaging: Small KM, Adler RS, Shah SH, et al. ACR Appropriateness Criteria® Shoulder Pain–Atraumatic. American College of Radiology. Available at https://acsearch.acr.org/docs/3101482/Narrative/. 2018; Accessed: August 30, 2018. Rapariz JM, Martin-Martin S, Pareja-Bezares A, Ortega-Klein J. Shoulder dislocation in patients older than 60 years of age. Int J Shoulder Surg. 2010 Oct. 4(4):88-92. [Medline]. [Full Text]. Antosh IJ, Tokish JM, Owens BD. Posterior Shoulder Instability. Sports Health. 2016 Nov/Dec. 8 (6):520-526. [Medline]. [Full Text]. Yuen CK, Chung TS, Mok KL, Kan PG, Wong YT. Dynamic ultrasonographic sign for posterior shoulder dislocation. Emerg Radiol. 2011 Jan. 18(1):47-51. [Medline]. Eljabu W, Klinger HM, von Knoch M. The natural course of shoulder instability and treatment trends: a systematic review. J Orthop Traumatol. 2017 Mar. 18 (1):1-8. [Medline]. [Full Text]. [Guideline] Expert Panel on Musculoskeletal Imaging:., Amini B, Beckmann NM, Beaman FD, Wessell DE, Bernard SA, et al. ACR Appropriateness Criteria® Shoulder Pain-Traumatic. J Am Coll Radiol. 2018 May. 15 (5S):S171-S188. [Medline]. [Full Text]. Chetouani M, Ropars M, Marin F, Huten D, Duvauferrier R, Thomazeau H. Is MRI useful to assess labral reduction following acute anterior shoulder dislocation?. Orthop Traumatol Surg Res. 2010 May. 96(3):203-7. [Medline]. Bencardino JT, Gyftopoulos S, Palmer WE. Imaging in anterior glenohumeral instability. Radiology. 2013 Nov. 269(2):323-37. [Medline]. Hendey GW. Managing Anterior Shoulder Dislocation. Ann Emerg Med. 2016 Jan. 67 (1):76-80. [Medline]. [Full Text]. Ng AW, Chu CM, Lo WN, Lai YM, Kam CK. Assessment of capsular laxity in patients with recurrent anterior shoulder dislocation using MRI. AJR Am J Roentgenol. 2009 Jun. 192(6):1690-5. [Medline]. 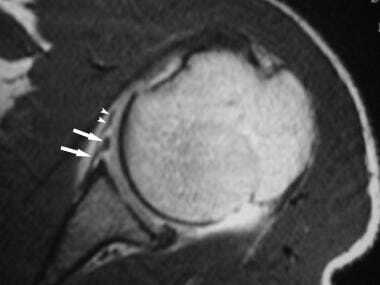 Magee T. 3-T MRI of the shoulder: is MR arthrography necessary?. AJR Am J Roentgenol. 2009 Jan. 192(1):86-92. [Medline]. Gyftopoulos S, Bencardino J, Palmer WE. MR imaging of the shoulder: first dislocation versus chronic instability. Semin Musculoskelet Radiol. 2012 Sep. 16(4):286-95. [Medline]. 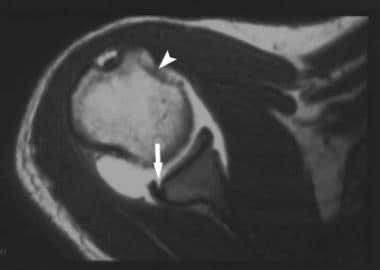 Gyftopoulos S, Carpenter E, Kazam J, Babb J, Bencardino J. MR imaging of subscapularis tendon injury in the setting of anterior shoulder dislocation. Skeletal Radiol. 2012 Nov. 41(11):1445-52. [Medline]. Jonas SC, Walton MJ, Sarangi PP. Is MRA an unnecessary expense in the management of a clinically unstable shoulder? A comparison of MRA and arthroscopic findings in 90 patients. Acta Orthop. 2012 Jun. 83(3):267-70. [Medline]. [Full Text]. Saliken DJ, Bornes TD, Bouliane MJ, Sheps DM, Beaupre LA. Imaging methods for quantifying glenoid and Hill-Sachs bone loss in traumatic instability of the shoulder: a scoping review. BMC Musculoskelet Disord. 2015 Jul 18. 16:164. [Medline]. Griffith JF, Antonio GE, Yung PS, Wong EM, Yu AB, Ahuja AT, et al. Prevalence, pattern, and spectrum of glenoid bone loss in anterior shoulder dislocation: CT analysis of 218 patients. AJR Am J Roentgenol. 2008 May. 190(5):1247-54. [Medline]. Lecouvet FE, Simoni P, Koutaïssoff S, Vande Berg BC, Malghem J, Dubuc JE. Multidetector spiral CT arthrography of the shoulder. Clinical applications and limits, with MR arthrography and arthroscopic correlations. Eur J Radiol. 2008 Oct. 68(1):120-36. [Medline]. Faria RS, Ribeiro FR, Amin Bde O, Tenor Junior AC, da Costa MP, Filardi Filho CS, et al. Acromioclavicular dislocation: postoperative evaluation of the coracoclavicular ligaments using magnetic resonance. Rev Bras Ortop. 2015 Mar-Apr. 50 (2):195-9. [Medline]. McArthur C, Welsh F, Campbell C. Posterior dislocation of long head of biceps tendon following traumatic anterior shoulder dislocation: imaging and intra-operative findings. J Radiol Case Rep. 2013 Sep. 7 (9):19-26. [Medline]. Lahham S, Becker B, Chiem A, Joseph LM, Anderson CL, Wilson SP, et al. Pilot Study to Determine Accuracy of Posterior Approach Ultrasound for Shoulder Dislocation by Novice Sonographers. West J Emerg Med. 2016 May. 17 (3):377-82. [Medline]. [Full Text]. Gottlieb M, Russell F. Diagnostic Accuracy of Ultrasound for Identifying Shoulder Dislocations and Reductions: A Systematic Review of the Literature. West J Emerg Med. 2017 Aug. 18 (5):937-942. [Medline]. [Full Text].